Comex closed before the FOMC announcement so the GOLD PRICE closed $1.90 lower at $1,117.30 and SILVER 9.7 cents higher at $14.975. But after that announcement they shot up, and gold is now trading 1,130.50 and silver $15.10. What encourages me most is that GOLD/SILVER RATIO, which gapped down mightily yesterday and went lower today, ending at 74.61. This sets the stage perfectly for a silver and gold rally, rally, rally. 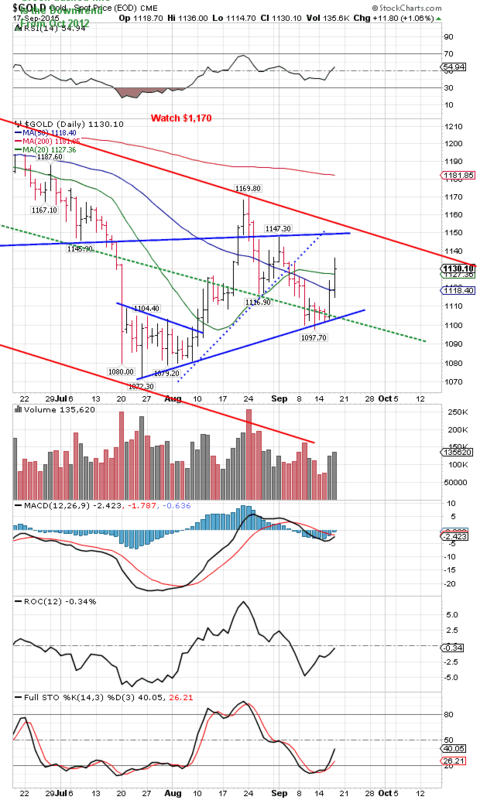 Now all ye gold-croakers and nay-sayers, deal with this: The GOLD PRICE fell down to the support line rising from the July low, bounced on that line 5 days, then bounded up off that line slicing through the 50 and 20 DMAs today. Don’t take my word for it, look yourself, chart on the right. Now we all know there’s a leetle resistance up around $1,140, but more important is $1,170 where the August rally failed. Just above that hovers the 200 DMA at $1,181.85. Y’all don’t laugh at me like that’s too much to hope for from here. It won’t take much fear brewing to push gold up there. Oh, silver! Honey! You braced your tiny feet on that 50 DMA and jumped plumb over that resistance at $14.95 end and bumped your pretty head through that downtrend line from the April 2013 high. Now you only need to beat beat that old August high at $15.72, then leap for that 200 DMA up at $16.06. Today the prophets on the FOMC appeared with comfortable lies in their mouths, urging themselves and the economy on to destruction. Forget what they said, and look at what they did, namely, they didn’t raise interest rates. What happened? Stocks fell, dollar tanked, interest rates cratered, and silver and gold jumped up. If you want a classic picture of how the Fed roils markets, go to www.nasdaq.com and look at any index’s chart today. Right after the FOMC announcement stocks sank, then rocketed back up, Dow reached 1690 in a sharp peak, then just as quickly sank to close down 65.21 (00.39%) at 16,674.74. S&P500 suffered the same schizophrenia, ending 5.11 (0.26%) at 1,990.20. Listen to me, hear what I say: sell stocks. Don’t mess around, the worst is yet to come, and right soon. Don’t listen one more second to those lying prophets. Dow in gold sank 1.43% today to 14.76 oz, bouncing off its 200 day moving average and turning decisively earthward again. Dow in silver dropped 1.81% to end right at its 200 DMA, 1,103.19 oz. US Dollar Index, as imagined by some nat’ral born durn fool from Tennessee, I can’t remember his name, sank a massive 104 basis points (1.08%) as the disappointed hot-money speculators ran out of the dollar like gamblers out of church when the preacher gets wound up on card-playin’ and drinkin’. Dollar cut through its 200 dma (95.29) like a hot knife through butter and ended at 94.51, the very scraping-bottom of the day’s range. Yas, suh, them central banks sho’ do stabilize markets and currencies, don’t they?